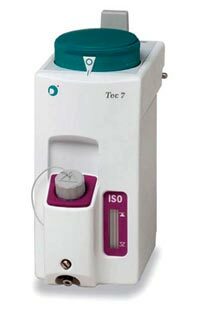 Last Quarter, Dr. Matthias asked about the teal/purple color coding on the GE Healthcare Tec 7 isoflurane vaporizer, and we learned from GE and ECRI that the color combination was designed with specific intentions, and was not known to be particularly confusing. However, we have received somewhat contrarian responses from several members of our Committee on Technology, and would like to share those with you now. The GE Healthcare, formerly Datex-Ohmeda, Tec 7 Vaporizer with teal concentration dial and agent-specific color coding near the agent filler and sight glass areas. Photo courtesy of GE Healthcare, with permission. The color-coded, vapor-specific indicator is near the fill port of each vaporizer and as you mention, it is specific to the color on the bottle. No anesthetic vapors are color-coded turquoise. Is it your belief that either you, or other clinicians have attempted to turn the wrong dial, or fill the wrong vaporizer because of this color issue? Do you know how frequently this might occur? I have turned on the wrong vaporizer many times since getting this new machine because I have the turquoise dial color “in my head” as the sevoflurane vaporizer. Colors should be used sparsely on medical equipment. In life, certain colors are used to evoke certain emotions—a whole design industry is dedicated to that end! Our safety standards in medicine nowadays require certain colors for signaling certain alarms in an intuitive way, e.g., a high priority alarm is red. Also, the 5 common anesthetic agents are color coded to improve intuitive usability. This coding scheme has made its way also into the new gas monitor standard, ISO 21647. The issue here may be that a large (and meaningless?) colored area on the dial may override the intuition of the smaller area of color code with signaling character. Coloring the dial appears to me to be an unfortunate choice—my suggestion: keep the dial and surroundings neutral! The answer above outlined the best solution. The safest approach would be to have the dial, the fill cap, and the bottle (and perhaps the vaporizer as well!) distinctly color coded. The more visual cues—the less chance of error. However, I would not push too hard, given that the likely worst case would be anesthetizing with an alternative inhalation anesthetic, which is usually titrated to effect off a dial that is calibrated in roughly equipotent concentrations per degree of turn. This shouldn’t be a big issue, but. . . how many drug errors occur due to similar packaging? It could be an excuse waiting to happen! Anything that decreases confusion is appropriate to safety, especially in a residency training situation.